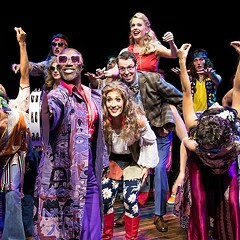 This New York-bound revival of the 1966 musical boasts a star who combines kooky clowning, innocent charm, and heartbreaking pathos. No, it's not leading lady Christina Applegate as taxi dancer Charity Hope Valentine, a role created by the great Gwen Verdon. The most exciting performer in this dance-filled show is nondancing former off-Loop actor Denis O'Hare, playing Charity's neurotically shy suitor, Oscar Lindquist. Their unlikely romance--she's a "girl with a past" and he's a naive romantic who thinks he's found the unsullied virgin of his dreams--is the crux of the story, inspired by Federico Fellini's Nights of Cabiria and brought to the stage by playwright Neil Simon, songwriters Cy Coleman and Dorothy Fields, and original director-choreographer Bob Fosse. Applegate is likable but bland, and her dances (choreographed by Wayne Cilento) lack the sultry sexuality and yearning intensity needed to make Charity more than just a birdbrained bimbo. But O'Hare's Oscar is complex, at once infuriating, sympathetic, and hilarious as he wrestles with his conflicted love and jealousy. It remains to be seen whether Applegate's TV and movie fame will translate into Broadway success. But Sweet Charity's Chicago run, which closes this weekend, is worth a visit primarily for O'Hare's deft tragicomic turn. Through 3/13: Thu 7:30 PM, Fri 8 PM, Sat 2 and 8 PM, Sun 2 PM. Cadillac Palace Theatre, 151 W. Randolph, 312-902-1400. $32-$77. Art accompanying story in printed newspaper (not available in this archive): photo/Paul Kolnik.